Many schools in Michigan have grappled with whether they should dump Native American mascots and nicknames. Plenty of things can stand in the way: history, tradition, emotion. But one Michigan tribe wants to make sure money isn’t the barrier to change. Belding has been the Redskins since the 1940s. The entry of the school and the field boast giant stones engraved with Belding Redskins and an image of a Native American chief in a headdress. Michael Ostrander is in his first year as principal of Belding High School. Before that he was a student who grew up as a Redskin. “While you’re in it, you’re so close to it that, you know you’re just kind of told you’re a Redskin and so you kind of feel that I guess in a way,” he said. 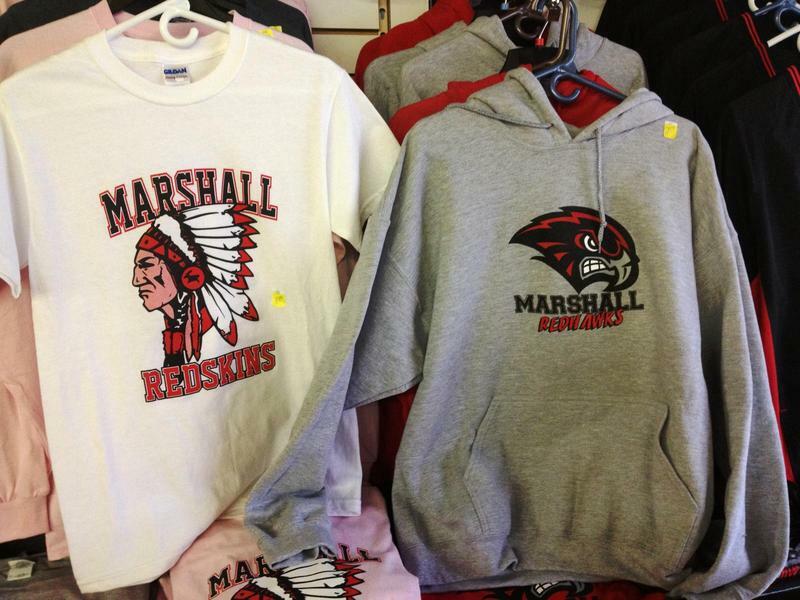 The school district started phasing out the mascot about a decade ago. It started using the Old English letter “B” for its moniker. But the B has really been a placeholder while it figures out its new identity. Belding has been in mascot limbo for awhile. A part of the reason is once you have an official mascot and nickname, there is a lot that has to change. And those things can be really pricy. “Scoreboards, gym floors, letterheads, all that other stuff that comes along with changing the mascot or negative imagery, it does pile up,” said Jamie Stuck, tribal council chairperson for the Nottawaseppi Huron Band of the Potawatomi. The Nottawaseppi Huron Band of the Potawatomi, along with advocacy groups and other tribes across the nation, have been trying to encourage schools to change mascots like the Chiefs and the Redskins. “Skins were proof of a deceased Native American or that they had put actual bounties on skins,” Stuck said. Stuck says after years of seeing protests and court opinions fail to change the minds of many schools, they decided to offer a different approach. The tribe decided to offer money to any school – public or private – that wants to change a mascot that uses Native American imagery. “Even when we were in agreement when there were issues, finances came into being an issue,” Stuck said. The tribe went to Governor Rick Snyder to amend their state revenue sharing agreement with the state. A part of the amendment will set up a Native American Heritage Fund. That fund will, in part, send money to public and private schools that want to change their mascot. The money will also be used for education and changing curriculum – which Stuck says is key to fixing the cultural perception of Native Americans. A lot of people still don’t understand the cultural trauma that we have been subjectified [sic] to in our past and our history,” Stuck said. Belding is expected to be the first school district to take advantage of the tribe’s offer. But even in Belding there is still some hesitation about changing their mascot. The district officially became the Black Knights a few weeks ago. The final decision by the school board to get a new mascot was unanimous. But some students still have doubts about rebranding themselves as Knights. Junior Jeffrey McNinch was wearing an older school shirt with the Belding Redskins on it when I talked to him. It’s not clear yet just how much money will be made available to schools. There are now 43 school districts in Michigan that use Native American references or culture for their school mascot or nickname. Not all of them are considered offensive, and some have agreements with local tribes to use the nicknames. But for holdout school districts, there could soon be consequences. The State Board of Education is looking into financial penalties for schools that continue to use these types of images and mascots. 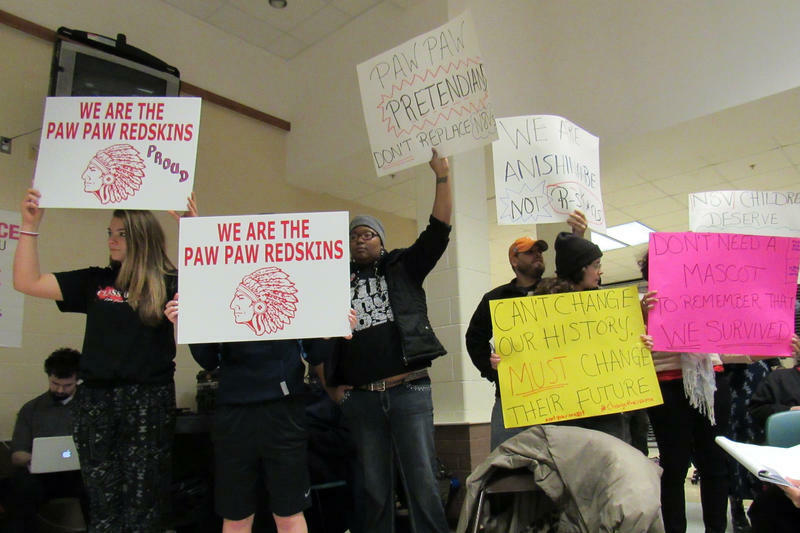 In a late night vote, the Paw Paw School Board voted to keep the Redskin name and image as its mascot. Supporters for keeping the mascot say the name is not used in a derogatory way and is a respected identifier for the community. Paw Paw High School sophomore Morgan Dwyer says changing the name is an issue being pushed by outsiders, who she likened to school bullies. “Ever since you’re little your parents always tell you, don’t shape who you are to please other people and I mean, I don’t know, I just feel this whole ordeal is a bigger version of that,” she said. Changes are coming to a tribal agreement with the state and Nottawaseppi Huron Band of the Potawatomi that would help schools change their mascots. The amendment will put money into a new Michigan Native American Heritage Fund. The fund is run by a board that will send the money to private and public schools that want to, “promote positive relationships with and understanding of the history and role of Michigan’s Indian tribes,” the tribe said in a press release. NHBP Tribal Chair Jamie Stuck says there is a cost barrier associated with changing a school’s mascot.